Today we’ve been experimenting with another alternative voltage modification that has been reported by a reader, the previous mods we have done did require solder bridges and replacement of resistors and the new one relies on a replacement of a single resistor. By replacing the R52 resistor (the resistor on the left of the R52 marking, the actual resistor we are replacing is R139) we can increase the voltage and thus be able to overclock even further the Gridseed ASIC devices, so we did experiment a bit with this modification today. The default resistor is a 402 type 33 kOhm one and the voltage we have measured across it was 1.1925V. The recommendation we got was to to use a 47 kOhm resistor, so we did just that, after replacing the standard 33 kOhm with a 47 kOhm 402 1% we have measured a new voltage of 1.6885V. This is a significant increase in the voltage that we knew would also lead to significant increase in the total power consumption of the device. The chips might be able to handle even higher voltage and allow for more overclock, however the higher the voltage, the higher the chances are that you will shorten significantly the life of the ASIC device. So if you decide to go for a higher voltage the increase in overclock frequency might get lower and lower, but the total power consumption will continue to increase significantly. After the voltage modification we were able to get stable performance at 1163 MHz overclock with zero to just a few HW errors per hour which is very acceptable for a local hashrate of about 495 KHS. The poolside results we’ve got with this overclock were about 480 KHS, so very good results in terms of performance after doing this single resistor voltmod. Note that you may have varying results on different miners, some might be able to get up to about 1200 MHz, on others you may need to lower to about 1150 MHz. Regardless of that the performance you can expect to get after doing the 47 kOhm resistor mod is close to 500 KHS or about 100% overclock from the stock 600 MHz and with about 65% performance increase. The expected overclock in Scrypt only mode is about 850 MHz and produces about 360 KHS local hashrate with low to no HW errors. Doing the voltmod can give you about 135 KHS more than what you get with the standard overclock, but also rises the question how much it will increase the power usage. 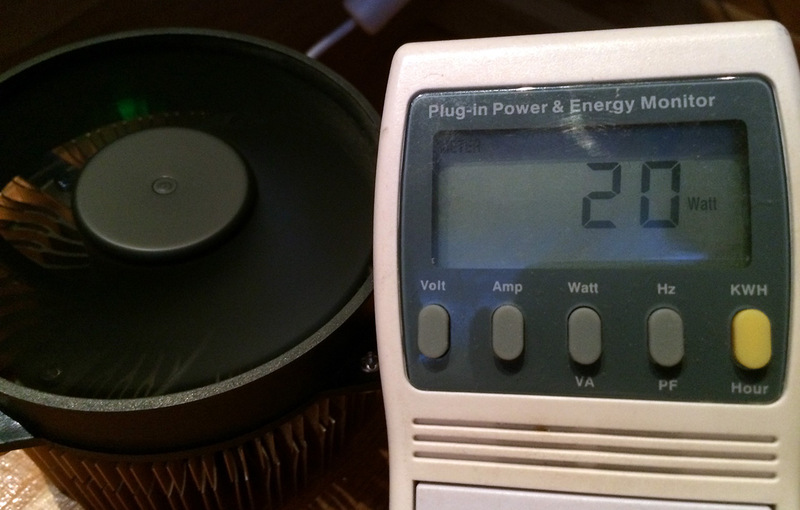 The total power consumption we have measured with a voltmoded Gridseed ASIC running at 1163 MHz was about 20W (including the fan), so it is pretty much double than what we were getting with the previous voltmods. 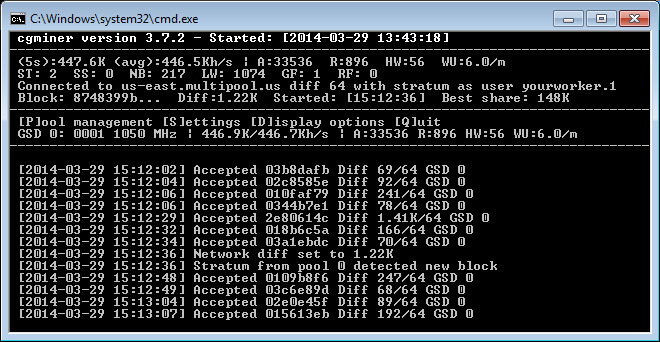 So the big question is it worth to do this extra high voltage modification in order to get a bit higher hashrate? On the short term it is worth it to be able to squeeze every last bit of performance you can get from the ASIC devices you have in order to get a faster return of investment and on time before the big and powerful ASIC devices start shipping later this year. On the long run however you may significantly shorten the life of the device, we cannot currently say how the significant increase of the voltage may affect the normal operation of the device a few months ahead. So a word of caution, be careful and be aware that this mod may significantly shorten the life of your ASIC hardware. Also going for higher voltage by using higher value resistor may just help you get just a bit more extra KHS, but will surely lead to even more significant increase in the power consumption. We are going to be giving more extensive testing of the 47 kOhm modification in the following days and reporting the results. 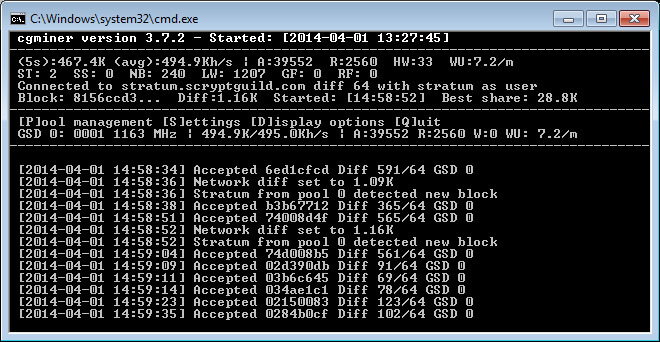 Most likely we are going to perform the modification to a few more miners in order to see the variance as well. Also going for 20W total power consumption is Ok for us, but 30-40-50-60W+ with minor extra performance on top is not worth it, though if you wish you could try with a 68 kOhm resistor for example for the maximum overclock, but do proceed with extreme caution as it will increase the voltage and power consumption quite a bit further than with 47 kOhm (voltage regulators may die with too much voltage and over 60W of total power consumption!!!). 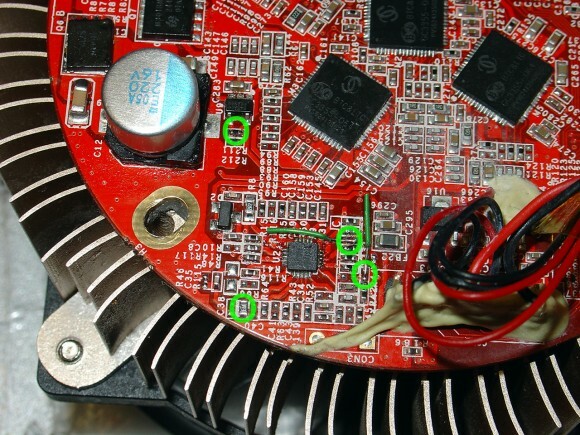 Do note that playing with voltages is dangerous and can easily lead to damaging your hardware. 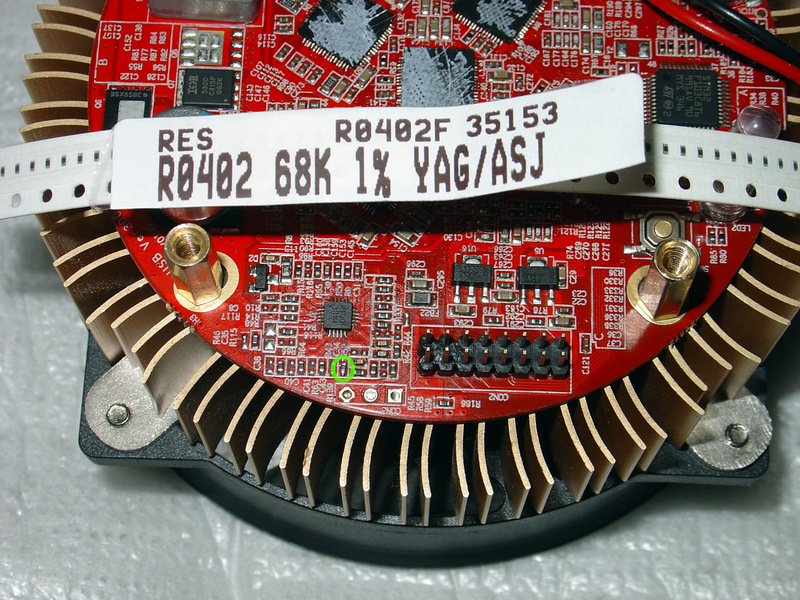 You should also be very careful with the cooling as you increase the voltage, so do monitor carefully the temperature of the GC3355 chips when you have the cooler disassembled and the unit is working in order for example to measure the voltage. And another word of warning, since 402 resistors are pretty small in size and hard to solder for many people, this mod is not suitable for inexperienced users, so better find somebody that can do it for you if you are not sure you will be able to handle it yourself. 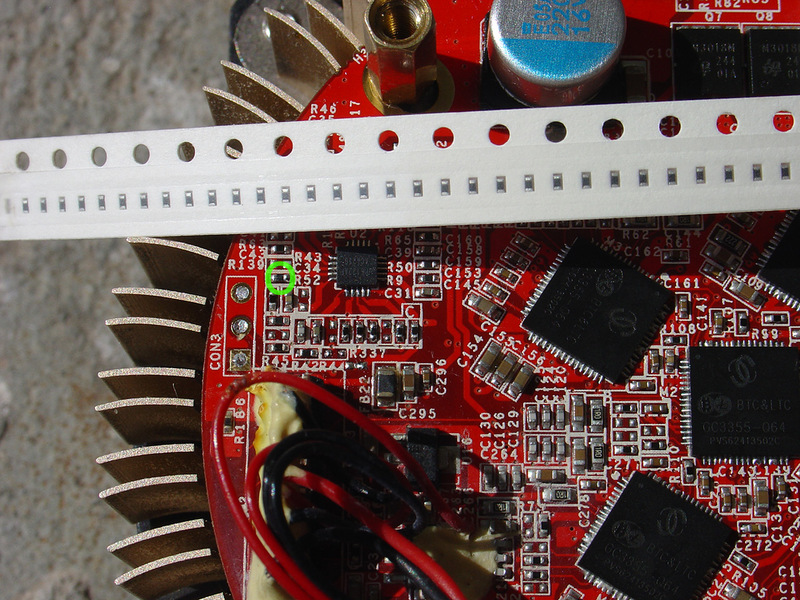 Time for another take on the voltmodding of the Gridseed 5-chip BTC/LTC ASIC miners with the latest development surrounding the voltage modifications of the devices. In our previous experience in doing a hardware voltage modification we were able to easily get up to 950 MHz overclock from the 850 MHz maximum overclock with the default voltage, or with other words up to about 404 KHS hashrate. The previous voltage mod we did included soldering two bridges on the board of the ASIC, the new one we have tried also includes replacing two resistors with other values. So doing 4 modifications in total, you can see them marked on the photo above with the hope of getting higher hashrate than with the previous voltage modification. The two zeroes in green on the right of the photo mark the places where you need to solder the bridges, we have used small pieces of very fine 30 AWG kynar wire, so that we could easily remove the bridges should we decide to remove the hardware modification. The resistor on the lower left side is 36 kOhm and we have replaced it with a 39 kOhm 1% 603 resistor (the standard one is 402 size, but we did not have the needed value in that smaller size, so we used the slightly bigger 603 size). The modification in the top left side of the resistor marked R211 has been done using pencil to change the resistance, however we went the better way and have tried replacing the resistor. The standard resistor used is a 402 size with 3.65 kOhm (1.1V PLL), we have tried replacing it with a 2.4 kOhm (1.0v PLL) and 2.7 kOhm (1.025) resistors and left the 2.7 kOhm 402 1% one in the end. 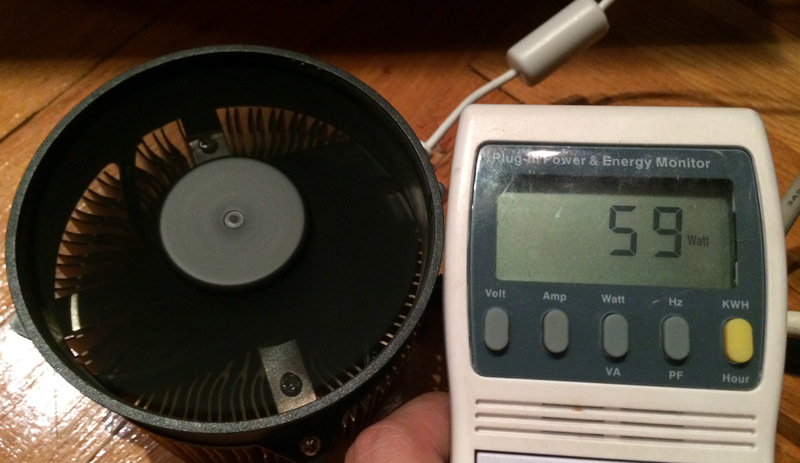 After the voltage modification described above we have tested to see what results we can get in terms of further overclocking the 5-chip Gridseed ASIC devices. We were able to run the device at 1050 MHz or about 450 KHs hashrate with not so many hardware errors, and at a step lower at 1025 MHz with a hashrate of about 436 KHS the device was able to run with with no HW errors at all. A nice improvement with no significant increase in power usage, however you should be aware that the hardware modification is not easy at all and not everyone will be able to do it all by himself. The 402 size resistors have a length of about 1 mm and width of 0.5 mm, so they are really SMALL and hard to solder and you need to replace such resistors on the board. Also do note the fact that you can damage the device when trying to do the hardware modification, so be very careful and if you are not sure you will be able to perform the mod yourself, you better not start doing it. Some users are already reporting in being able to achieve even higher overclocks by supplying more voltage to the chip, but with a significant increase in the total power consumption that apparently is multiple times than the normal power consumption in Scrypt only mining mode. This pretty much make such modifications pointless as you are getting something like 10-15% more hashrate at the cost of multiple times the power usage, not to mention the high possibility of seriously shortening the life of the devices. We are going to be playing a bit more with the voltage modification, mainly trying some more resistors to see if we can squeeze a bit more extra performance out of the Gridseed ASIC devices without increasing the voltages too much and staying close to the 10W power consumption.